It was only a few years ago that I’d hear that question rather frequently. This was before Twitter became a big deal, before Instagram, LinkedIn was still just a resume dump, and Facebook had only recently changed from being TheFaceBook for college students. The first time I went to a media conference to meet people in the tourism industry, I’d get polite but quizzical looks when I introduced myself as a “travel blogger” instead of a “travel writer.” To me, there wasn’t much difference other than the publishing medium, but to them, blogs and blogging were still an oddity. Why would they want media coverage from a blog? Did I have any newspaper or magazine travel outlets instead, perhaps? 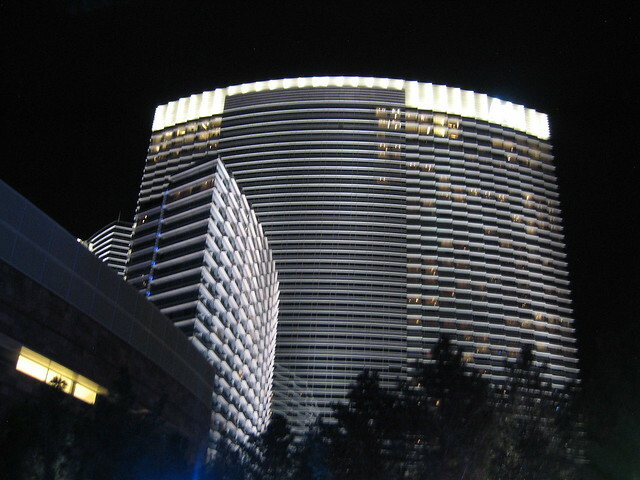 Aria Hotel & Casino, Las Vegas, will be location for 2014 DMAI annual conference. Thanks to a number of factors including an emphasis on professional growth through events like TBEX, we now have the attention and interest of the tourism industry. More and more CVBs (Convention and Visitors Bureaus) and other DMOs (Destination Marketing Organizations) are looking for media coverage from online publishers who tell compelling travel stories through their social media networks, including but not limited to a blog. They want blog posts, images, social network updates and video that can reach their potential visitors and hotel guests, and yes, we can certainly deliver that. While networking and speed dating between bloggers and DMOs has been a TBEX feature for awhile, we’ve never had anything like it at a purely tourism industry event….until now. This year is the 100th anniversary of the biggest destination marketing organization in the world: DMAI, the Destination Marketing Association International. The DMAI 2014 annual conference/#DMAI14 is a multi-day event in Las Vegas, July 21- 23 at the Aria Resort and Casino, and this year there is a special program just for travel bloggers. 1. Go to the DMAI Media Influencer Rally page, read through the details, then click the blue “Register Now” button on the right sidebar. 2. That will take you to a CVENT info Summary page; skim that and hit the orange “Register Now” button. 4. Now you’re on the Influencer application page, where you’ll provide some information to DMAI about your blog(s) and social media channels. 5. Those who are chosen will be notified ASAP via an email from DMAI. Destinations want the world to know about what they offer. You want terrific travel stories about extraordinary places. Apply now to attend the first-ever DMAI event that connects travel media and the tourism industry. Author Bio: Sheila Scarborough is a writer, trainer and speaker. She launched a family travel blog on BootsnAll in February 2006, co-founded and still writes for the Perceptive Travel blog,and provides social media training for the tourism and hospitality industries through Tourism Currents. Sheila and TBEX, this sounds like a great opportunity for travel bloggers. I certainly hope they take a look. What an excellent post, I would love to participate in this event. I will sure to post this in the Travel Bloggers Network on facebook. It’s certainly a great opportunity for travel bloggers to grow partnerships and stay on the cutting edge of the industry. I am so sad that I saw this post way too late to apply. Ironically I missed the application deadline because I have been traveling so much! I will keep this on my radar and won’t miss the application deadline if they do this again that’s for sure! Super Informative Post! Excited to hear more about the event as it happens and looking forward to applying next year!